The invitation and introduction is offered on the journal post for 1 Night/AKBAL. Suggestions for daily practice are offered on the Vision Quest Ceremony page. Tone 5 brings the Power to Fuel a Spiritual Climb. The first 6 days of the trecena facilitate our process of Spiritual Growth. Our increasing Consciousness is guided by the Choice of our Intention and our Passion to make it so. Tone 5 resides at the “center of the cube.” Within our Center is the “intelligent, organizing force” that manages knowledge, communication, materials and application. At the center of the cube we conceive our ways of movement that correspond with our Divine Inspiration. Deer/MANIK is the sign of the Mayan Priest, and the Giver of Spiritual Tools. The glyph represents a Hand (another name for MANIK) that reaches up on behalf of the Whole to grasp a current of Divine Power. Deer/MANIK encourages us to grasp our Truth of Spirit to complete the circuit of Divine Power. Deer is said to keep every Spiritual Tool its ever used. It’s most-used tools are to stand silently in its own Truth, and Vigilance to survey the landscape in all of the 4 directions. As a Day Sign of the West, Deer relates to the “hard road of life” and our experience of facing the unknown. Representing the Element of Water, Deer touches our Emotions through which we are Empowered by Spirit. Deer/MANIK is one that guides and protects the Whole. Through the direct connection to Spirit, Deer holds a position of Divine Authority. Deer/MANIK is called on to live in its highest integrity. The gift of Divine Authority wields a power that is not its own, but the empowerment to carry out the Intentions of the Creator. We engage our power when we do what the Creator would do. The Truths central to the Creator are Unconditional Love and the Divine Justice of Peace, Harmony, and Equity. We can know that we’re operating in our Highest Integrity when our Intentions hold Unconditional Love for the Highest Good of the Whole. As an Agent of the Divine, we were created to be God’s Hands in the world. Through our emotions, Deer/MANIK makes us aware of our limitations. The Divine Purpose is to share the Spiritual Tools that are capable to overcome them. Deer helps us see that our “limits” are only “illusions.” The eye of the Deer, the circle illustrated on the “hand” of the glyph, is the way to discern the Truth from the Illusion. The Meaning and Purpose of the MANIK is to demonstrate our Divine Source of Unlimited Power. Our Spiritual Growth is represented as the climb to the top of the pyramid… what we must accomplish by our own Truth and Power. Our Transformation is carried out on the steps that descend. Like the unseen force of Gravity, a Divine Agency offers the service of Divine Intervention to complete the task of Higher Consciousness. Deer/MANIK reminds us to use the Spiritual Tools we find proven and worthy, the Truths that lie beyond Faith – the Truths that We Know. Today we will be given a new Spiritual Tool, an unwavering Truth we can Know and stand on. When we know our own Truth we can move forward with meaning and purpose. MANIK encourages us to be vigilant of our own feelings of fear, so we can discern the presence of our own illusions of personal limitation. We can be healed by turning directly to the Source of Divine Power that can speak through the heart. To all my relations, may we have the courage to stand on what we believe. May we look to the Truth we already Know. Our secure foundation is built upon One Truth added to another through our incremental experiences of living. We can always fall back to the One Truth we Choose to Know, that we are Loved Unconditionally and created for a Divine Meaning and Purpose. We are Always “enough” to accomplish our most important task. May we Honor all the Ancestors who preserved the way to find it for our Self. May we be conscious of our feelings of limitation, knowing they have been brought into our Consciousness for a healing. May we employ our proven and worthy tools as the Power to complete a new Climb of Spiritual Growth and open our mind to Divine Inspiration that has born the test of time. The following are worthy authors and teachers that have influenced my path. Their wisdom is preserved through the books they’ve written. These are Elders who’s teaching has been proven and worthy on my path to understanding. Marcellus “Bear Heart” Williams: Bear Heart was a spiritual leader of the Muskogee Nation-Creek tribe. His book “The Wind is my Mother,” [Amazon] shares his wisdom through meaningful stories of his own “growing up” on the shaman’s path, inspiring indigenous ways of understanding. Minisa Crumbo Halsey: Minisa is Bear Heart’s niece and was raised on the path of Spirit under his direct care, consistent with indigenous tradition. Minisa’s teachings were valuable to me as an offering of direct experience through the practice of Sacred Ceremony. Her book, “Spirit Talk: A Count of Days,” [Amazon] is an accounting of her daily experience of the natural world. Her encouragement to journal each day was the inspiration that started this journal. Minisa is also a video producer who’s most recent work is “Spirit Talk – The Life and Work of Woody Crumbo,” a DVD documentary on the life of her father, renowned artist, Woody Crumbo. Also available on her website are Native American Flute CD’s by Woody, Jr. Minisa is an artist in her own right with public art installations and works in many mediums. Ian Lungold: Ian was among the researchers of the Mayan calendar who shared the Wisdom with Western society. His videos on the Mayan Calendar are still an inspiration, shared on MayanMajix.com and preserved by Michael Shore. His biography share his diverse path. Ian was the GGG Grandson of Johnnie Appleseed (John Chapman). Ian planted the seeds of understanding the Mayan Calendar. Jose Jaramillo: Jose produced and directed the video, “The Alignment Within” (available from MayanMajix.com), which is a wonderful introduction to the Mayan calendars. The video shares inspiration and human synchronicity with the calendar. Minisa and I have attended his events, and the Mayan Fire Ceremony shared by a group of Daykeepers in Colorado is featured on the video. Jose has led tours to the Chiapas area in Guatemala. His articles are also included on MayanMajix.com. Drunvalo Melchizedek: Drunvalo is a well-known author of the Flower of Life books, as well as “Serpent of Light: Beyond 2012,” in which he shares his experience with the Mayan elders. I include Drunvalo because his teachings have been around me for so long and because he is a humble and worthy source of spiritual wisdom. His “Flower of Life” books were part of my first understanding. “Serpent of Light: Beyond 2012” shares his shamanic work with the Mayan elders. I’m grateful for every Spiritual Tool I’ve ever been given that has helped me to face the “hard road of life” and the unknown future. I’m grateful for the Old Ones who preserved the Sacred Wisdom to share for the Highest Good of All. What’s your “Mayan Destiny Sign” – the Seed of Your Intention? 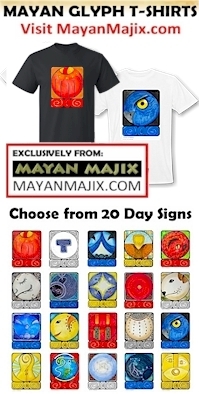 Calculate your Mayan birthday on MayanMajix.com. I love to hear from you. If you have a question about the Vision Quest I am here to answer. As I make my own Vision Quest I will imagine us Dancing together and remember you in my prayers. Behalf every one, thanks for sharing the links to the Elders’ wisdom. Best greetings and many blessings I sent to you through the roots of the two centuries old oak that stand on the border of my field.